Work with speed and accuracy. Whatever your colour photocopier requirements are, OMM will always provide you with a fast and competitive service. This colour A4 multifunctional is designed for cost conscious businesses that require productive high-quality colour communication for small workgroups. Its compact design fits perfectly into various environments as a desktop or floor standing device. This compact and user-friendly colour A3 multifunctional device provides high-quality colour communication and streamlines document workflows. Its security and cost control features make it ideal for busy workgroups. The imageRUNNER ADVANCE C3300 Series offers small workgroups access to powerful information management solutions. Impressively compact and cost effective, these multifunctional colour devices can change the way you work. 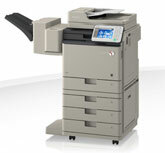 Desktop A4 25 ppm printing, fast Single Pass DADF scanning, compact document management solution. This 20 ppm compact device is the perfect choice for small workgroups and offices looking for practical functionality and smart communication in colour at minimal investment. 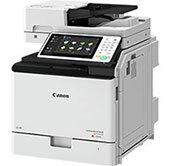 Powerful A3 colour multifunctionals, perfect for busy offices that need connectivity, speed, reliability and quality printing. This smart multifunctional enables high-quality colour communication at 30 ppm. Easy integration, security and cost control features in an environmentally sound package add true value to busy offices. This smart multifunctional enables high-quality colour communication at 35 ppm. Easy integration, security and cost control features in an environmentally sound package add true value to busy offices. This smart device enables high-quality colour communication at 45 ppm. Integration with powerful Fiery-based RIPs makes it the ideal choice for busy offices with graphically intense needs. This smart multifunctional enables high-quality colour communication at 45 ppm. Easy integration, security and cost control features in an environmentally sound package add true value to busy offices. This smart device enables high-quality colour communication at 51 ppm. Integration with powerful Fiery-based RIPs makes it the ideal choice for busy offices with graphically intense needs. This smart multifunctional enables high-quality colour communication at 51 ppm. Easy integration, security and cost control features in an environmentally sound package add true value to busy offices. This smart, user-friendly, colour A3 multifunctional device provides high-quality colour communication and streamlines document workflows. Seamlessly integrating into any working environment, its security and cost control features add true value to busy workgroups. This high-end office solution delivers colour output at 55 ppm with versatility and quality, which fit perfectly in your workflows whilst safeguarding information and protecting the environment. This high-end office solution delivers colour output at 65 ppm with versatility and quality, which fit perfectly in your workflows whilst safeguarding information and protecting the environment. This heavy-duty print solution delivers colour output at 70 ppm with versatility and quality, which fit perfectly in your workflows whilst safeguarding information and protecting the environment. The imageRUNNER ADVANCE C7500 series delivers excellent productivity and colour quality for your business. Targeted for high print volumes and with its versatile finishing options, it is an ideal investment for both internal and client-facing communications. It also provides an intuitive operation for the user and safeguards information, making this series a valuable addition to your business. The first office printer with production print technology and exceptional quality, which integrates seamlessly and securely into any environment.